In this paper, the surface stoichiometry, acid-base properties as well as the adsorption of xanthate at ZnS surfaces were studied by means of potentiometric titration, adsorption and solution speciation modeling. The surface proton binding site was determined by using Gran plot to evaluate the potentiometric titration data. Testing results implied that for stoichiometric surfaces of zinc sulfide, the proton and hydroxide determine the surface charge. For the nonstoichiometric surfaces, the surface charge is controlled by proton, hydroxide, zinc and sulfide ions depending on specific conditions. The xanthate adsorption decreases with increasing solution pH, which indicates an ion exchange reaction at the surfaces. Based on experimental results, the surface protonation, deprotonation, stoichiometry and xanthate adsorption mechanism were discussed. Zinc sulfide is one of the most important industrial minerals of zinc metal, which is usually recovered by flotation technology, in which the mineral surfaces are treated hydrophobic. Synthetic zinc sulfide is also well known as electroluminescence material. In fact, due to its wide applications and potential use as a spintronic material in high technology field, it was one of the most studied luminescence [1–10], photo catalyst , special morphology [11–16] and mesoporous materials [17–21] in inorganic synthesis. It was reported that transition metal doped nanocrystals of semiconductor like zinc sulfide can yield both high luminescence efficiencies and life time shortening . The doped semiconductor nanocrystals seem to represent a new class of luminescent material, with wide range application in e.g. display, lighting and lasers [2–10]. In past years the dramatic surface effect of nano sized ZnS was reported , which states that when the surface of a ZnS nanoparticle gets wet, its entire crystal structure rearranges to become more ordered, closer to the structure of a bulk piece of solid ZnS. It was also reported  that zinc sulfide nanoparticles, a mere 10 atoms across have a disordered crystal structure that puts them under constant strain, increasing the stiffness of the particles. Obviously surface chemical property of zinc sulfide plays a critical role in these phenomena. When zinc sulfide are put into aqueous solution, the surface hydration takes place at once, the adsorption of proton and hydroxide ions make the surface either positively or negatively charged in the absence of foreign ions. Due to the sensitivity of sulfide ions to oxygen, redox reactions at the surfaces may take place as well. The surface properties are influenced by overall equilibrium of surface and solution chemical reactions including solution acid base and redox reactions, surface complexations, precipitation and dissolution. All theses reactions are very fundamental to understanding of aforementioned mineral flotation, surface modification and inorganic material synthesis processes. Therefore, it is meaningful to study the acid-base and reduction properties of zinc sulfide as well as their correlation with these processes. Furthermore, the surface stoichiometry of zinc sulfide will not only influence the surface charge but also have some impact on the preparation of luminance material, inorganic synthesis of nanoparticles, which deserve a deep going study. The surface complexation of zinc sulfide in relation to mineral flotation was studied [24–27] and some surface reaction constants were reported. Xanthate having the structure ROC(= S)S-M+ (R = alkyl; M+ = Na+, K+) is a type of collector widely used in sulfide mineral floatation. The uses of xanthate as capping agents for stabilizing colloids [28, 29] and as precursors for metal sulfide nano-particles [30–33] have also been studied and the adsorption mechanism plays an important role in theses process and deserves further studies. Although the surface stoichiometry of zinc sulfide may profoundly affect its adsorption properties, the systematic knowledge on this aspect is lacking. In this paper, surface stoichoimetry, acid-base and redox properties as well as the adsorption of xanthate at ZnS surfaces were studied by means of potentiometric titration, adsorption and solution speciation modeling. 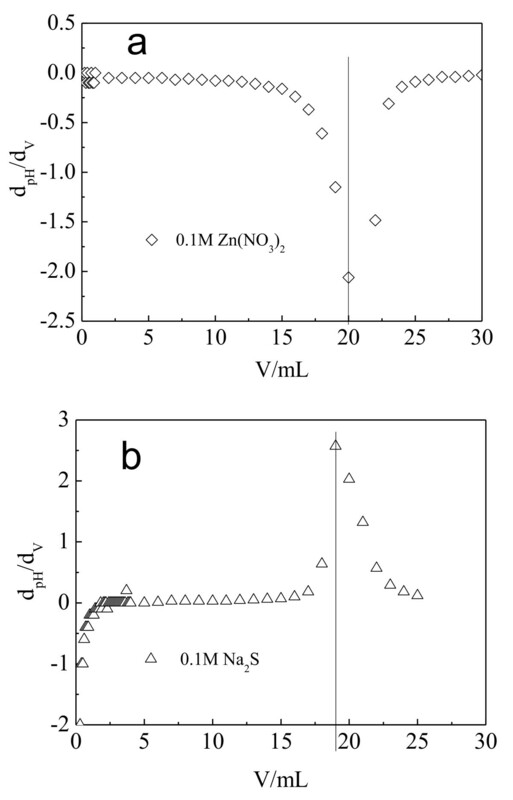 Testing results indicate that the state of surface stoichiometry of ZnS plays an important role in its adsorption process. The adsorption of xanthate and the surface charge at the ZnS surfaces is in the order of zinc rich ZnS > stoichiometric ZnS > sulfur rich ZnS. There are four types of chemical reactions in ZnS-H2O system, i.e. solution acid-base reaction, solution redox reaction, precipitation and dissolution as well as surface complexation reaction . In certain pH and redox conditions, some chemical reactions play more important roles than others and consequently the relevant reaction products become major species in the system. Relevant chemical reactions and their equilibrium constants collected from published papers and relevant database [24–27, 35], are listed in Table 1. * Surface complexationwas a concept presented by Stumm and Schindler et al in the end of 1960s and the beginning of 1970s and now it is widely used as a useful tool to treat the sorption data in mineral suspensions . The basic ideal of that is to regard the mineral surfaces as a functional groups carrier; therefore the surface chemical reaction can be treated in the same way as those of solution chemical reactions. The only difference between the surface and solution chemical reactions is the former one has surface charge, thus the situation of the electrical double layer EDL of mineral surfaces should be considered in performing the surface complexation studies. The three surface complexation reactions of ZnS presented in table 1 are the surface protonation (62), deprotonnation (63) and ion exchange (64) reaction respectively. ≡SZn denotes the surface binding site of ZnS. The overall chemical equilibriums of these reactions decide which reaction is more important than others at each specific condition, such as pH, concentration etc., and sometimes several reactions play important roles simultaneously. Based on these chemical reactions excluding surface complexation, an Eh-pH diagram can be established and shows in Figure 1. From Figure 1, the predominant area of various species at varying Eh and pH value can be seen. Here, Eh defined as the potential of standard hydrogen electrode represents the redox level, when Eh is negative indicating a reductive atmosphere, and vice versa. It is obvious that ZnS is stable in acidic pH when Eh is below zero. At alkaline pH, however, ZnS is stable at more negative Eh value. The oxidation product of ZnS is zinc sulfate in acidic solution and zinc hydroxide precipitate in alkaline solution. Between pH about 7 to 10, at more positive Eh, the dominant species is Zn4(OH)6SO4(s). When Eh is between -0.9 V and -0.4 V, the ZnS is dominant species. In order to compare the influence of excess zinc or sulfide ions to the system, the distribution diagrams in three different cases, i.e. the equal amount of zinc and sulfide ions, zinc in excess and sulfide in excess is presented in Figure 2a, b and 2c respectively. It can be seen from Figure 2a that when zinc and sulfide ions are in equal concentration (100 mM), the solid ZnS(s) is dominating species in entire pH range between 3 and 11, free zinc ion only appears at pH below 4 and in very low level (< 0.1%), the dissolution is negligible. When zinc ions are in 1% excess, i.e. 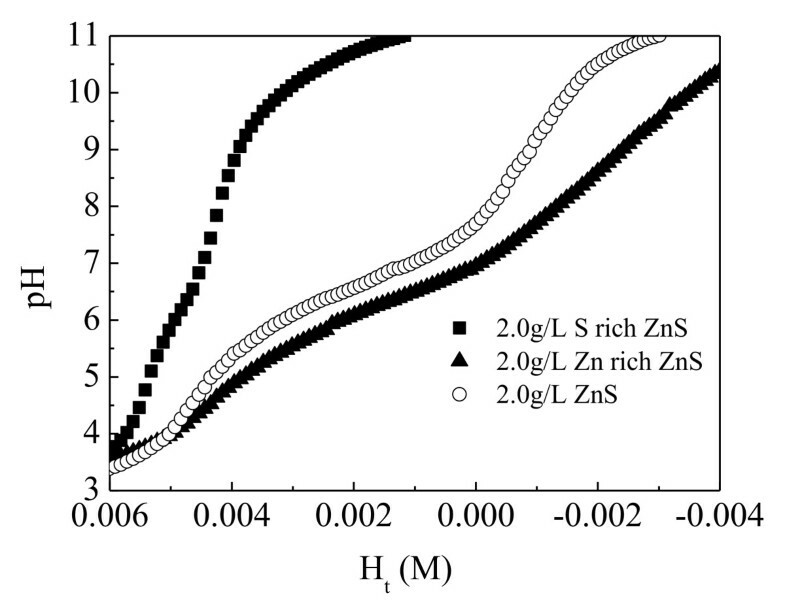 in the presence of 101 mM Zn2+ and 100 mM HS-, we can see from Figure 2b that besides the formation of ZnS(s), among the soluble zinc species, Zn2+, ZnOH+, Zn(OH)2, is in turn dominating with increasing solution pH. When solution pH is higher than 8.2, Zn(OH)2(s) starts to form and becomes main species only after ZnS(s) in higher pH. When pH is approaching 11, Zn(OH)3- appears. However, when hydrogen sulfide ions are in 1% excess, i.e. 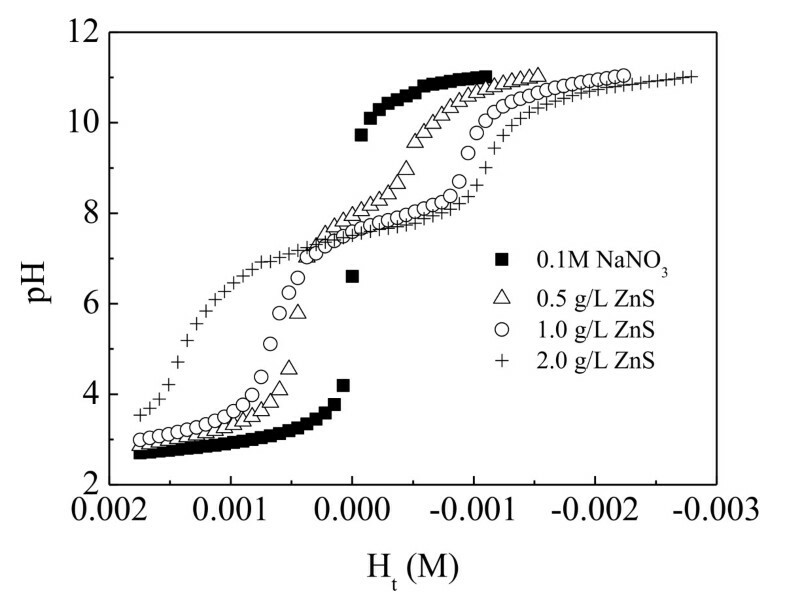 in the presence of 101 mM HS- and 100 mM Zn2+, we can see from Figure 2c that besides the formation of ZnS(s), in the soluble zinc species, H2S, HS- is in turn dominating with increasing solution pH. The adsorption of these solution species at the surface of zinc sulfide may affect its surface charge. In the presence of oxygen the surface and solution species distribution will be changed due to the oxidation of zinc sulfide. However, in some technological processes the oxidation of fresh surface may be a slow process, the aforementioned distribution diagram may still be largely applicable depending on the situation of surface oxidation. Predominant area diagram in Zn 2+ -HS - -e - -H 2 O system. (Zn2+ = 0.1 M; HS- = 0.1 M). Distribution of zinc species in Zn 2+ -HS - -H 2 O system as a function of pH in the presence of: a) 100 mM Zn 2+ , 100 mM HS - ; b) 101 mM Zn 2+ , 100 mM HS - ; c) 101 mM HS - , 100 mM Zn 2+ . Some typical potentiometric titration results of stoichiometric zinc sulfide are presented in Figure 3. Ht is defined as total acid concentration i.e. pH changes of zinc sulfide suspension with varying solid concentration as a function of total acid concentration H t .
Here, Ha, Va, Hb, Vb, and V0 denote the acid concentration of burette, added acid volume, base concentration of burette, added base volume and original volume respectively. It can be seen that between pH 4 to 10 the solution of 0.1 M NaNO3 has no buffer capacity. When the concentration of ZnS sample suspension is 0.5 g/L, the pH buffer range is between pH 7 to 9 and the buffer capacity and range are getting bigger and widen when the solid concentration is increased. With increasing the solid concentration from 0 to 2 g/L, the increase of pH buffer capacity of sample suspension indicates clearly the influence of the concentration of surface binding site and the acid-base properties of these sites. As well known that the solubility of zinc sulfide is very limited, the pH buffer from the soluble zinc ions should be negligible therefore the pH buffer of solution can only originate from the surfaces. If so, the change of solid concentration will correspondingly change the buffer capacity and it is indeed the case. We have qualitatively checked the soluble species in the supernatant of ZnS suspension by titrating with acid solution and found out that there is no pH buffer capacity, which means the soluble ions is negligible. 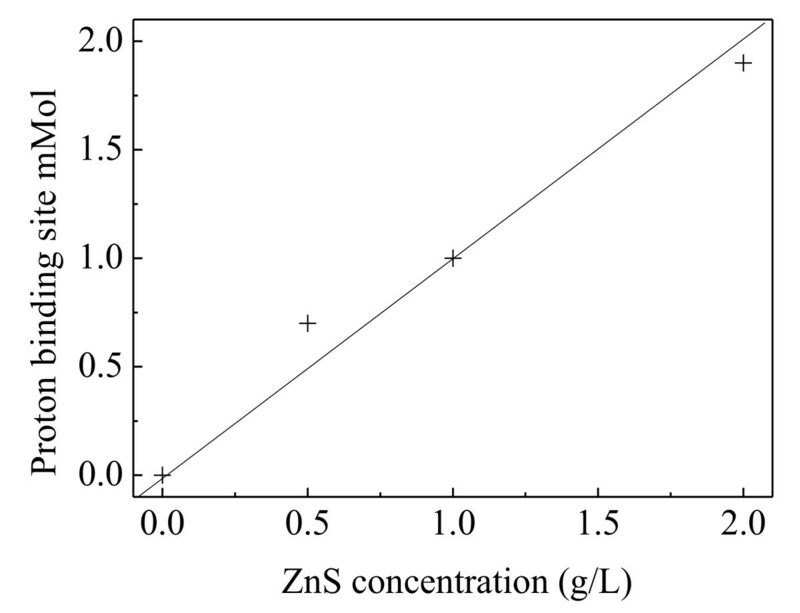 From Figure 3 it can be seen clearly that the pH change behaviors of zinc sulfide suspension with changing total concentration of acid varies as a function of solid concentration. The higher the solid concentration of zinc sulfide is the more the pH buffer capacity of corresponding suspension. 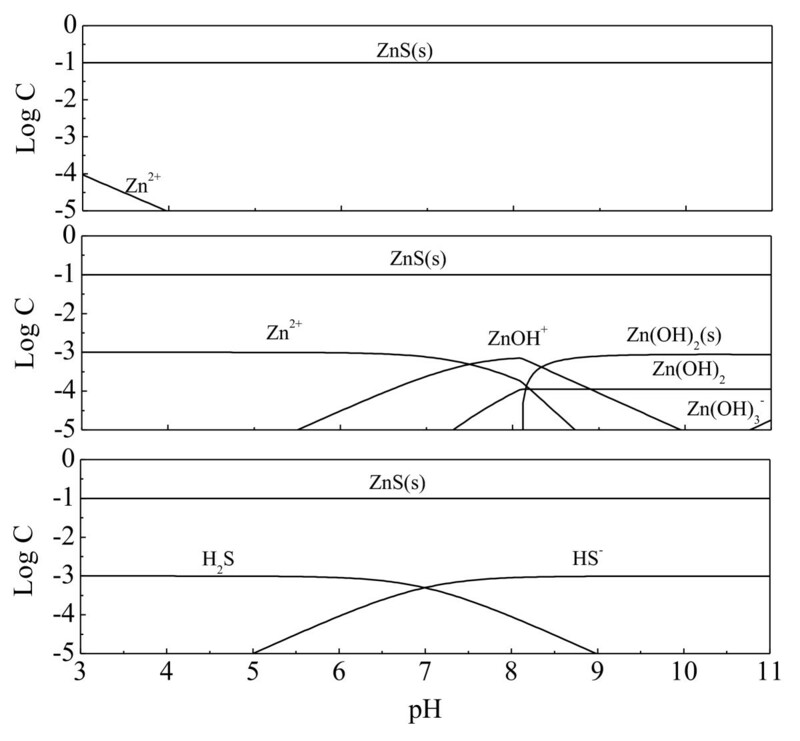 In the suspension of zinc sulfide samples prepared in zinc rich or sulfide rich solution, the pH changes as a function of total acid concentration are shown in Figure 4. Figure 4 indicates that the stoichiometric zinc sulfide surface has quite different acid base properties from that of either zinc excess or sulfide excess surface. The state of surface stoichiometry plays an important role for its surface chemical properties. For the zinc rich samples, the pH buffer capacity and range are increased, which suggests that the pH buffer capacity in this case comes from surface binding sites. For the sulfide rich sample, although some changes can be observed in pH buffer capacity and range, but they are marginal in comparison with stoichiometric and zinc rich sample. Between pH 6 and 9.5 some pH buffer behaviors can be observed, indicating deprotonation at surface binding sites. These phenomena indicate that these samples have quite different surface acidity constants. If we compare the titration curves of sulfide rich samples with that of pure 0.1 M NaNO3 medium, the differences is obvious. In fact no pH buffer behavior can be observed for the 0.1 M NaNO3 solution (see Figure 3). 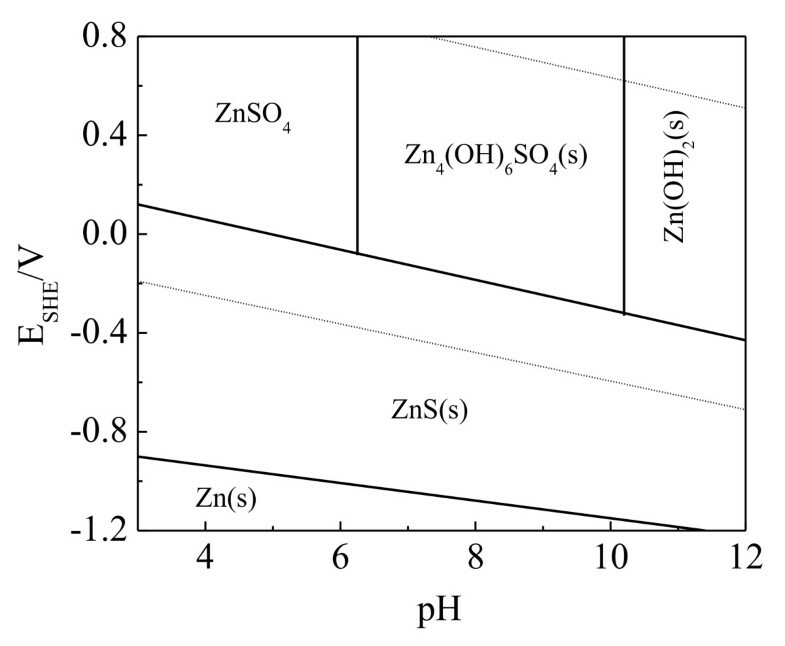 It seems that the adsorption of sulfide ions at surface zinc site reduce the pH buffer capacity brought by surface zinc site hydrolysis and the surface stoichiometry affects the surface acidity constant of ZnS samples. 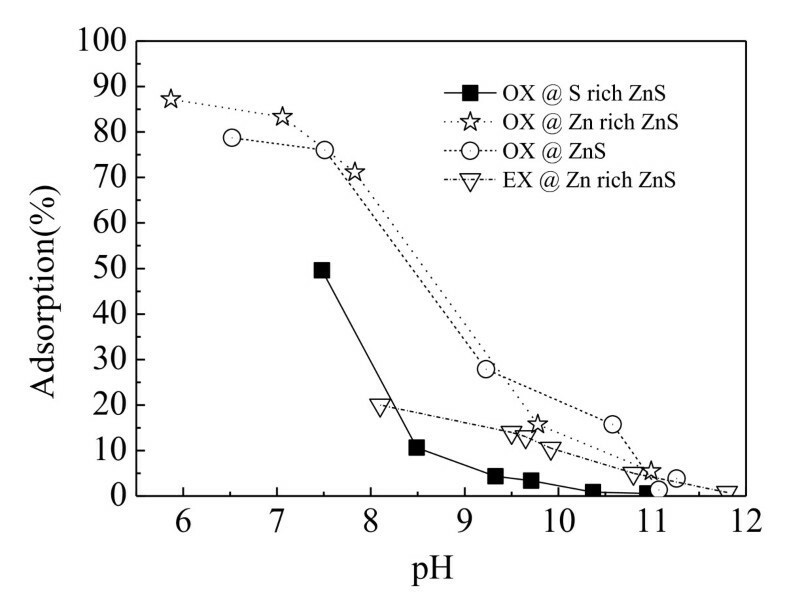 pH changes in sulfide rich, zinc rich and stoichiometric zinc sulfide suspension as a function of H t .
The surface state of zinc sulfide can be schematically depicted in Figure 5, black and white circle represent zinc ion and sulfide ion respectively. Here number 1, 2, 3 respectively demonstrates stoichiometric, zinc rich and sulfide rich zinc sulfide surface before hydration and number 4, 5, 6 respectively shows stoichiometric, zinc rich and sulfide rich zinc sulfide surface after hydration. In water solution, the stoichiometric surface of zinc sulfide should have equal amount of zinc and sulfide ions and be neutrally charged at the point of zero charge i.e. pHpzc. The zinc rich or the sulfide rich surface should be either positively or negatively charged. These surfaces tend to adsorb water, hydroxide or proton to reduce the surface energy. Consequently proton and hydroxide are balanced or one of them dominating at the surfaces. Some notable phenomena can be shown in Figure 6a and 6b when sulfide solution is titrated with zinc ions or vice versa. Schematic illustration of the surface stoichiometry and hydration of zinc sulfide 1. Non hydrated stoichiometric ZnS surface; 2. Non hydrated zinc rich ZnS surface; 3. Non hydrated sulfur rich ZnS surface; 4. hydrated stoichiometric ZnS surface, 5. hydrated zinc rich ZnS surface; 6. hydrated sulfur rich ZnS surface. Derivation of pH (dpH/dv) as a function of sulfide or zinc ions addition during zinc sulfide formation. a. 0.1 M sodium sulfide solution is titrated with 0.1 M zinc nitrate solution. b. 0.1 M zinc nitrate solution is titrated with 0.1 M sodium sulfide solution. It can be seen from Figure 6 that when 20 mL 0.1 M sulfide solution is titrated with 0.1 M zinc ion solution, the equivalent volume of zinc ion solution should be about 20 mL and is indeed 20 mL. However, when the 20 mL 0.1 M zinc ion solution is titrated with 0.1 M sulfide solution the equivalent volume of sulfide is about 19 mL. This phenomenon may be expressed as that when zinc ion solution is titrated with sulfide ion solution, the equivalent volume corresponds to the surface state of 5 in Figure 5. After the excess zinc ions in solution is consumed by forming bulk zinc sulfide and zinc rich zinc sulfide surfaces, the addition of sulfide ions induces the quick increase of hydroxide in solution and sudden jump of the pH value. Gran plots of zinc sulfide suspensions. Here Hs, Had and Hex denote surface proton binding site, total added proton and excess proton respectively. The Hex can be determined by Ve of acid-base titration. The proton binding site of zinc sulfide surfaces in the suspension as a function of solid concentration, which is largely linearly related, is shown in Figure 8, bearing in mind that some errors can occur in the process of acid base titration due to mineral coagulation or flocculation. Surface proton binding site of zinc sulfide as a function of solid concentration. In sulfide mineral flotation process, the ethyl xanthate can only be weakly adsorbed at the surface of zinc sulfide. The longer carbon chain in xanthate, the better the adsorption at the surface of zinc sulfide is. However, no matter which xanthate is used, the functional group and the adsorption mechanism are basically the same. Zinc sulfide has advantage of being IR transparence material and the adsorbents at the surfaces can be easily detected by FTIR techniques. 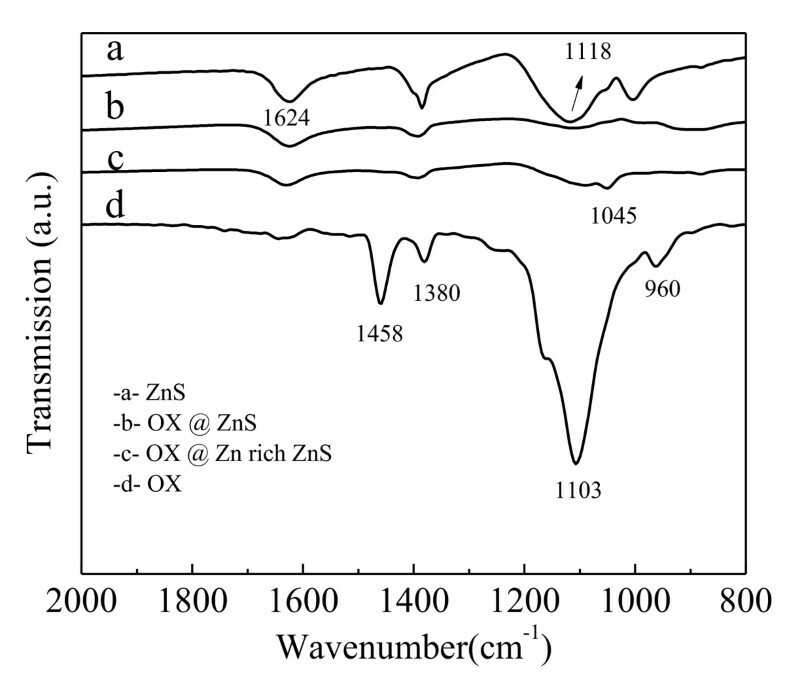 The IR spectra of various zinc sulfide sample after adsorption of octyl xanthate are presented in Figure 9. 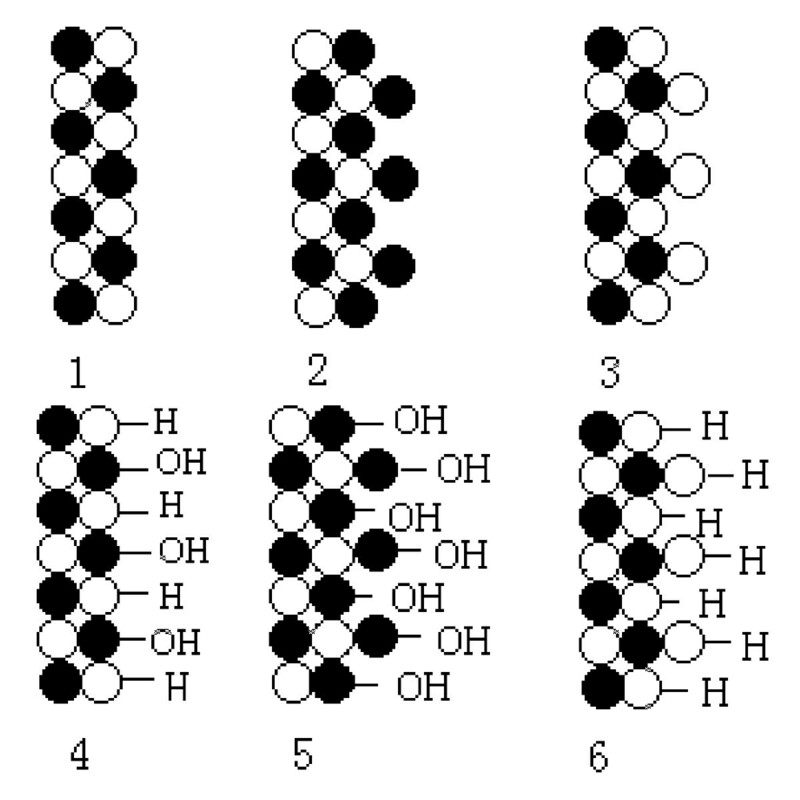 In Figure 9, the fingerprint region of adsorbed octyl xanthate (OX) is shown. As literature reported [37, 38], the bands in the region of 1200-1030 cm-1 are mainly influenced by the CS2 symmetric (νs) and asymmetric (νas) vibrations, and by the COC asymmetric (νas) stretch with some influence from CS2/COC deformation (δ) vibrations as well as rocking (νr), wagging (νw) and twisting (νt) of CH2/CH3 entities in the alkyl chain. Similar peak assignments have also been found in reference . It is evident, in Figure 9, after adsorption of xanthate; that some peaks appear around 1110 cm-1 and 1045 cm-1, which differ some wave numbers from that of zinc sulfide (Figure 9(a)) and octyl xanthate (Figure 9(d)), indicating the feature spectra of adsorbed xanthate. 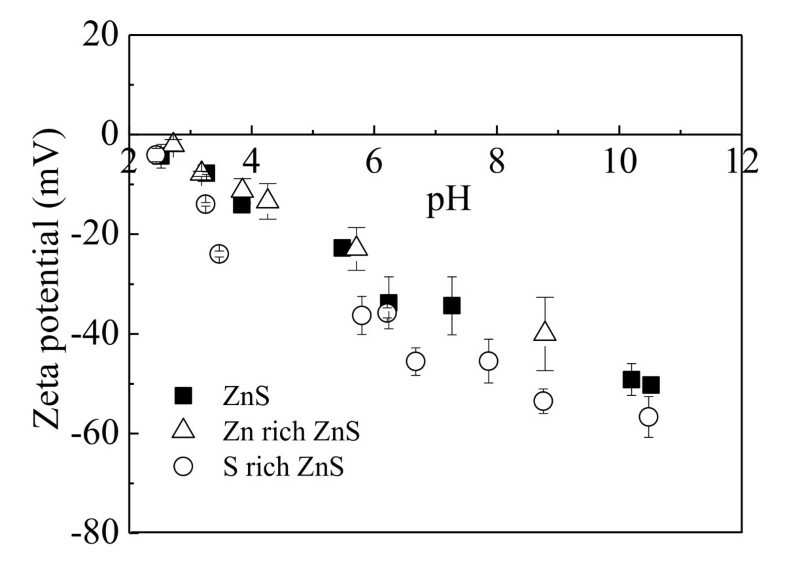 It can also be observed that at the zinc rich ZnS surface the IR spectrum red shifts more than that of stoichiometric ZnS. In Figure 9, there are also distinct bands originating from the aliphatic chain of the xanthate molecule, such as bands with peak frequencies around 1388 cm-1 (δs(CH3)). FTIR spectra of samples. (a) ZnS; (b) ZnS after adsorption of octyl xanthate; (c) Zn rich ZnS after adsorption of octyl xanthate; (d) octyl xanthate. As a model substance of sulfide minerals the xanthate adsorption mechanism at zinc sulfide may give information about adsorption mechanism at the other sulfide mineral surfaces as well. Figure 10 shows the adsorption behaviors of ethyl and octyl xanthate at zinc sulfide surfaces as a function of pH. The adsorption of xanthate decreased with increasing solution pH from pH 8 to pH 11, indicating a pH dependent adsorption behavior of xanthate at zinc sulfide and ion exchange between the adsorbed xanthate and hydroxide ions in solution. This phenomenon was reported as the well known Barsky relation , i.e. the ratio between free xanthate and free hydroxide in solution is constant, which was derived from the critical pH value of collector adsorption. Bearing in mind the surface protonation phenomena reported in this study, the Barsky relation should also be closely related with the surface pKa values of the sulfide minerals. It is also noticed that the adsorption quantity of octyl xanthate at the surface of sulfur rich surface is less than that of zinc rich and stoichiometric zinc sulfide. It is also evident that the ethyl xanthate is adsorbed less than that of octyl xanthate at the same pH region. Adsorption of ethyl and octyl xanthate at the surface of zinc sulfide as a function of solution pH. In order to further investigate the reasons, some zeta potential measurements were carried out; the results are presented in Figure 11. It can been seen from Figure 11 that the sulfur rich ZnS sample has more negative zeta potential, which can explain why it can adsorb less xanthate i.e. the more negative surface charge prevent xanthate from adsorption. In comparison to xanthate ions, sulfide may be more competitive ions for surface zinc site, because the solubility product of ZnS is much less than that of zinc xanthate. From Figure 11 we can also see that the zinc rich ZnS sample has slightly less negative zeta potential than that of the stoichiometric ZnS, which can explain why it can adsorb more xanthate than the others. 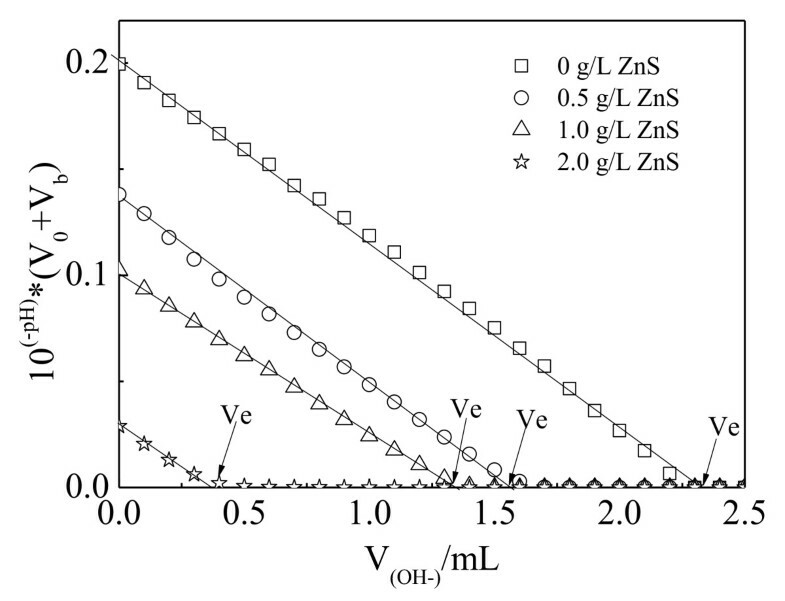 It is not surprising that the surface electro kinetic properties of zinc rich ZnS is similar to that of the stoichiometric ZnS, some surface excess zinc ions may be released from the surfaces during hydration especially in alkaline pH, in which zinc hydroxide will be formed. It is worth to note that the pHpzc of the sample are all near pH = 2.5, indicating at acidic pH the surface are similar, i.e. the excess zinc ions or sulfide ions may be released from the surfaces. From the solution speciation in Figure 2, we can understand that in acidic pH, the zinc ions may transfer from the surfaces into solution in the suspension of zinc rich samples and sulfide ions may transfer from the surfaces into solution by forming H2S in the suspension of sulfide rich samples. Zeta potential of different zinc sulfide samples as a function of pH. In the process of inorganic synthesis of nanoparticles, employing template such as xanthate [31–33] may be needed in order to obtain ideal products. The interaction of template with solid surface and transformation of precursor into metal sulfide nanoparticles are necessary steps. The surface stoichiometry and sorption properties of zinc sulfide shall directly influence the quality of final nanoparticle products, which dictates the releasing rate of metal ions from metal xanthate precursors. Therefore the studies of the surface fundamental properties will help to understand relevant process regarding inorganic synthesis and to elucidate the mechanisms so as to optimize the synthesis process. Zinc nitrate, sodium sulfide, sodium hydroxide, potassium hydroxide, hydrochloric acid, sodium nitrate, carbon disulfide, acetone, petroleum ether, ethanol, octanol and ethyl xanthate are all analytical grades and were purchased from Sinopharm Chemical Reagent Co., Ltd. Octyl xanthate were synthesized using carbon disulfide, octanol and potassium hydroxide as source materials and recrystallized three times using acetone and petroleum ether to get enough purity (> 99%). Doubly distilled water was used throughout entire study. Stoichiometric zinc sulfide sample was prepared by precipitation from a stoichiometric mixture of aqueous zinc nitrate and sodium sulfide and the specific surface area of this sample was determined by Nova 2000e BET instrument from Quantachrome to be 37.6 m2/g. The zinc rich zinc sulfide sample was prepared by precipitation from a nonstoichiometric mixture of 2 parts of aqueous zinc nitrate (0.2 M) and 1 part of sodium sulfide (0.1 M). The sulfide rich zinc sulfide sample was prepared by precipitation from a nonstoichiometric mixture of 2 parts of sodium sulfide (0.2 M) and 1 part of aqueous zinc nitrate (0.1 M). The BET surface for sulfide rich and zinc rich samples are considered to be about the same as that of the stoichiometric sample because both the synthesis process and the mass of solid formed are basically the same. All samples were rinsed with doubly distilled water three times and dried in an oven at 80°C for over 8 hours. Fourier transforms infrared (FT-IR) measurements samples in KBr pellets were carried out by means of a Bruker Vertex 70 FT-IR spectrometer. One centimetre diameter and constant weight KBr pellets were prepared by mixing the sample with KBr at 1:100 ratios. The spectra were measured in the wavenumber range of 400-4000 cm-1 with 100 scans at 4 cm-1 resolution. Zeta potential of samples was measured using a Zeta meter (JS94H) based on the mobility of electrophoresis. The zeta potential measurements of sample as a function of pH were carried out in the solution with the ionic strength of 1 mM NaNO3. In this procedure, a series of sample in a closed 50 mL polyethylene test tube with solid sample concentration of 0.8 g L-1 was conditioned in a thermostatic shaker at 25°C. The pHs of the suspensions were adjusted using either acid (0.1 M HCl) or base (0.1 M NaOH) solutions. After shaking overnight (24 h), the samples were allowed to stand for 5 min to let larger particles settle. An aliquot taken from the supernatant was used to measure the zeta potentials. The average of 5 measurements was taken to represent each measured potential and the error range of the measurements is also marked in the presented diagram. The sulfide samples of different solid weight (0.05 g, 0.10 g and 0.20 g) in a titration vessel with 100 mL 0.1 M NaNO3 solution (with a stop and without special protection from an inert gas) were titrated respectively with acid (0.1133 M HCl) or base solution (0.10 M NaOH), and after conditioned magnetically for 5 minutes, the resulting pH was recorded. The glass electrode was calibrated using the standard pH buffer solutions before each titration. The adsorption studies of ethyl and octyl xanthate by various ZnS samples (0.8 g/L) were conducted by a batch technique at 25°C. For these adsorption studies, a series of 50 mL polyethylene test tube containing 25 mL of xanthate solutions of 0.05 mM concentrations closed with a stop were employed at a varying pH. All pH adjustments were made by adding the requisite amount of dilute acid (HCl) and dilute base (NaOH) and the influence of pH was then determined by examining the adsorption of xanthate at a desired concentration over a pH range of 5.0-12.0. These in a thermostatic shaker were shaking continuously for 60 minutes to attain equilibration and then a part of the suspension was withdrawn and centrifuged at 16000 rpm for 10 minutes. The residual concentration of xanthate in the supernatant was then determined spectrophotometrically by measuring the absorbance at λmax of 301 nm against the standard calibration curve with linearity of R2 = 0.9991 between 0.0 and 0.1 mM. The pH value of the ZnS suspension before centrifugation was recorded using a combined glass electrode, which was calibrated using standard pH buffer solutions before use. The speciation modeling of solution species was carried out using computer program MEDUSA and the relevant equilibrium constants were collected from the MEDUSA database . In performing the speciation modeling, we need assigning the concentration for each involved component and selecting the diagram type before running MEDUSA program to get calculation results and relevant diagrams. For example, to get the predominant Eh-pH diagram in Zn2+-HS--e--H2O system, we need giving the concentration for Zn2+ and HS-, the Eh and pH range before running MEDUSA. The calculations cover all possible chemical reactions in Zn2+-HS--e--H2O system, including acid-base reactions, redox reactions and precipitation and dissolution reactions presented in Table 1. 1. Potentiometric titration is a useful tool in the determination of surface proton binding site of zinc sulfide and in the evaluation of surface stoichiometry. The surface proton binding site determined was found to be increased quantitatively with increasing solid concentration of zinc sulfide. 2. The surface stoichiometry strongly affects the surface properties of zinc sulfide; either zinc rich or sulfur rich surface will bring different acid base properties, i.e. different surface acidity constants. 3. Xanthate adsorption at the surface of zinc sulfide decreased with decreasing surface zinc ions and increasing solution pH indicating the importance of surface zinc site and an ion exchange process between the hydroxide ions in mineral suspension and adsorbed xanthate ions at the surfaces. Financial support from Chinese Natural Science Foundation (No.50874052; No. 20677022) and National Basic Research Program of China (No. 2011CB933700) is gratefully acknowledged. MW carried out most experiments and drafted the manuscript; QZ carried out the measurement of acid base titration; WH assisted to the equilibrium calculations; ZS has formulated the research idea and finalized the manuscript. All authors have read and approved the final version.